Today we left Lisbon and made the journey to the city of Talevera de la Reina in Castilla-La Mancha. We passed through beautiful landscapes, with spring very much in evidence. Wild flowers made seas of blue, purple and yellow in the fields and on the hillsides. Storks stood guard at almost every communications tower, ready to pass on the latest information. The logistics of each new day, finding venues, parking of the bus, locating accommodation…brings its challenges and sometimes stress. Humour is often the best defence. One of the many memories that will stay with me from the time in Portugal is the wicked humour of the activists and the volunteers and the many laughs we had on the way. 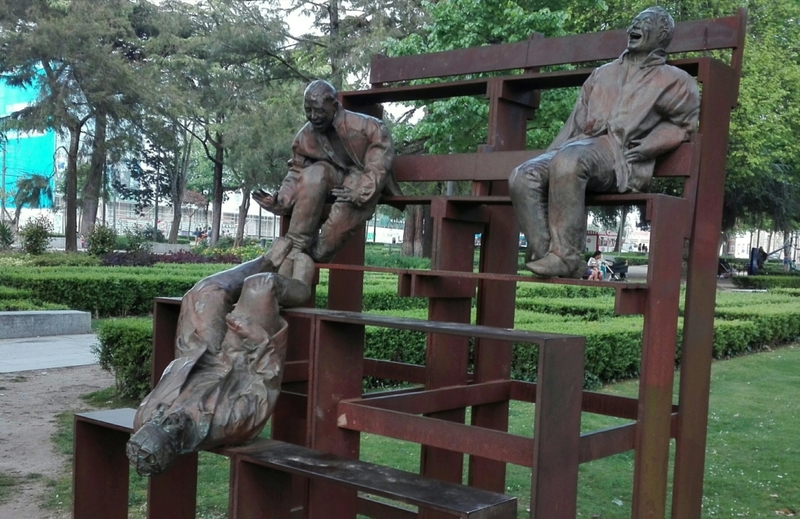 So I really appreciated this sculpture (one of series of 5) we saw in a park in Porto.